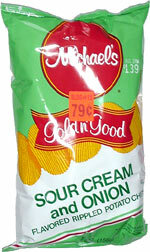 Taste test: These are good narrow-rippled sour cream and onion chips. Nice taste, with a good mix of sour cream and onion. The bag was about half full, with very few broken chips.